OMGosh! This CottageCutz Penguin w/Ski's is so cute - I just love him! Some of my all time favorite color combonations are just perfect for winter cards and layouts and this penquin fits right in. I shaded around his scarf, feet, bill and ski's with ink and added some pen detailing around them too. I tore some white cardstock for a strip of snow and added some mounting tape to the back of the finished die to pop him up just a bit. This cute little guy will be popping up on lots of my wintertime projects! 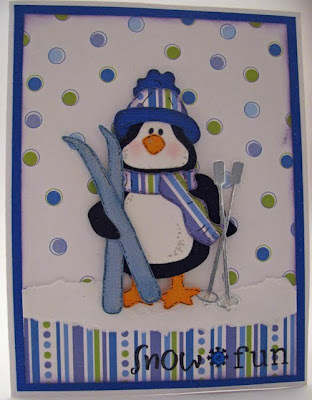 I am loving all of the penguins for Winter layouts but I LOVE how you used the Penguin with Ski's for this adorable Winter card!! Your color choices are fantastically "cool"! Wonderful detailing, too! So Coooool and love the polka dots!! !